A boy who lived on the Destiny Islands. He looks out for Tidus and Selphie like a big brother. Nobody knows what happened to him after his island disappeared. A boy from Sora's islands. A boy from the Destiny Islands, just like Sora. He's the oldest kid in the bunch, but doesn't throw his weight around; when his bruddas (or sista) need something, he's there to make sure they're taken care of. A boy from Destiny Islands who takes good care of his friends. Wakka is a minor character in the Kingdom Hearts series, originally from Final Fantasy X.
Wakka is a resident of the Destiny Islands and a friend of Sora, Kairi, and Riku. He spends a lot of time with Tidus and Selphie, and treats them just as a big brother would. He and Tidus expressed their curiosity over the Secret Place, and were thinking of exploring it. Like Selphie and Tidus, Wakka appears in Sora's Dive to the Heart on the Destiny Islands area. His question, "What do you want outta life?" also helps determine the leveling pace throughout the rest of the game. Sora can answer with either A) to see rare sights, B) to broaden my horizons, or C) to be strong. Later, he can be fought while on Destiny Islands; if he, Tidus, and Selphie are all defeated, Sora can duel all three of them at once. It is unknown what happens to him after Destiny Islands is destroyed, though he reappears when the worlds are restored after Sora defeats Ansem, Seeker of Darkness. A memory-based version of Wakka appears inside the Destiny Islands simulation in Castle Oblivion. Some time after Marluxia's, the real Wakka is shown playing with Selphie and Tidus on a beach while Kairi is facing the small island. On their way home after school, Selphie mentions to Kairi that Wakka and Tidus are too "wrapped up in their ball game" to go with to the small island with her. A data version of Wakka appears on the data version of Destiny Islands, alongside Tidus and Selphie. He appears on Destiny Islands talking to Sora. Wakka is fifteen years old at the beginning of Kingdom Hearts and Kingdom Hearts Chain of Memories. Wakka is one of the tallest children on Destiny Islands and has a strong build. His skin is tan, his eyes are brown, and his orange hair is spiked with an enormous coif. He wears a pale yellow tank top with black lining and white laces, tipped with green and yellow beads, and baggy yellow pants that close up halfway down his lower legs, each leg featuring a large, grey "X"-shaped strap with blue tips. He also wears green sandals, blue wristbands on each wrist, and small stud earrings. 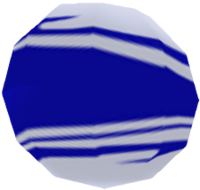 He often carries a white and blue ball, which he uses as a practice weapon. On Destiny Islands, he practices fighting skills with Sora, using his ball as a thrown weapon. During this battle, if Sora can manage to block one of Wakka's attacks via hitting the ball back at him, it earns him one tech point. If Wakka jumps in the air and throws the ball at Sora and Sora successfully blocks it he gets two tech points. After defeating Tidus, Selphie, and Wakka as individuals, Sora is able to fight against them all at the same time. In Final Fantasy X, Wakka is a major character and a twenty-three year old professional Blitzball player. 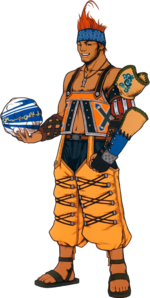 His is the first person to meet Tidus after the young man washes ashore in the world of Spira, and recruits him to his Blitzball team. Throughout the game, Wakka forms a close brotherly relationship with Tidus, helping him navigate the traditions and lore of this new world, believing him to be mentally ill following his contact with Sin. Wakka uses blitzballs as his weapons in battle for long-ranged attacks, making him a useful combatant against flying enemies. Wakka retains his battle stance in Kingdom Hearts, and his attacks resemble his basic attack and his Status Reels Overdrive from his original game. Selphie's comment on Wakka's and Tidus's ball game in Kingdom Hearts II is a reference to Blitzball. 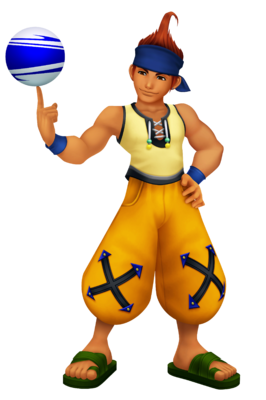 Originally, Wakka was not intended to be in Kingdom Hearts; his role was supposed to be filled by Irvine Kinneas from Final Fantasy VIII. Wakka's character model is reused and with a new palette for a minor character. This character can only be seen in Agrabah after you have cleared the story as one of the many non-playable characters managing the shops, but doesn't reappear again in subsequent visits as the Heartless reappear once the player leaves and comes back. Wakka is the only Final Fantasy character from Destiny Islands or Twilight Town to use the same weapon as his original incarnation, albeit with slight variations. This page was last edited on 3 April 2019, at 02:45.